You open your waffle iron, excited for a tasty hot waffle just to find that the waffle has split in two and is completely stuck to the top and bottom plates. What a major let down! So what happened? Why did the waffle stick to the pan? And if this is a problem that keeps happening to you, what should you do? This article will tell you how to stop waffles from sticking to the waffle iron. The first issue that may be causing your waffles to stick to the plates is that the waffle maker is not hot enough when you are adding the batter. If the waffle iron is not heated sufficiently, the inside will still be raw when you open up the plates, causing the top and bottom to separate. If your waffle maker has an indicator light to tell you when it is hot, try waiting a few minutes longer before pouring your batter in. You can also try flicking some batter onto the hot plates with a fork- if the batter sizzles, the iron is hot and ready! While it may seem like cooking spray is the perfect solution to stop waffle from sticking, using too much spray can be harmful to your waffle maker. Cooking sprays can build up on the plates and actually make them stickier. That is the opposite of what you want! If you have been using cooking spray, your waffle iron plates may need a nice deep clean to remove some of the buildup. Check out our blog on how to get that waffle maker nice and clean. If you waffle maker has non-stick plates, skip the spray and oil all together- these machines are designed to work with no greasing needed! They are best left alone. If your waffle iron is not equipped with non-stick plates, use a pastry brush and some canola oil or vegetable oil to grease the plates before each round of waffles. You may simply be opening the waffle maker a little too early (I know it is hard to wait for a delicious hot waffle!!). Make sure you are letting your waffles cook completely before opening up the plates. If your waffle maker has a light which tells you when the waffles are done, try waiting a minute or two longer. If your waffle iron does not have a light, check the manual to see the suggested cook time. You can always open the plates a tiny bit to do a sneak peak of the waffle too- if it isn't golden brown and crispy, let it cook a little more! The waffle batter you are using might be too thin. Thinner waffle batter is no good especially if you have waffles that tend to stick. Add a little less milk to your batter to make it thicker. Also try our amazing waffle batter recipe or our super fluffy waffle batter recipe- both have been tried and tested in many waffle makers and will give you perfect, thick batter! If none of these tricks have helped you stop waffles from sticking to the plates, then it may just be time for a new, better waffle maker. There are so many great, affordable, non stick options you can choose from! 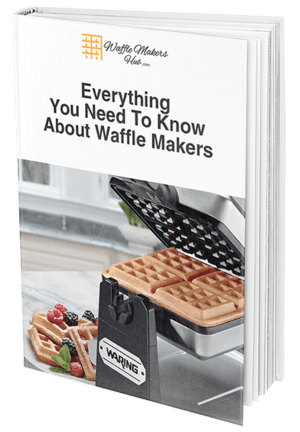 Our ultimate buying guide to the best waffle makers is a great place to start your waffle maker research. Our YouTube Channel will also show you some great live reviews of waffle makers that make nice, whole, non-sticking waffles. Don't worry, you will get those perfect waffles one way or another!